Emily McIntosh's Twitter profile reads: "I wrap burritos at Chipotle." 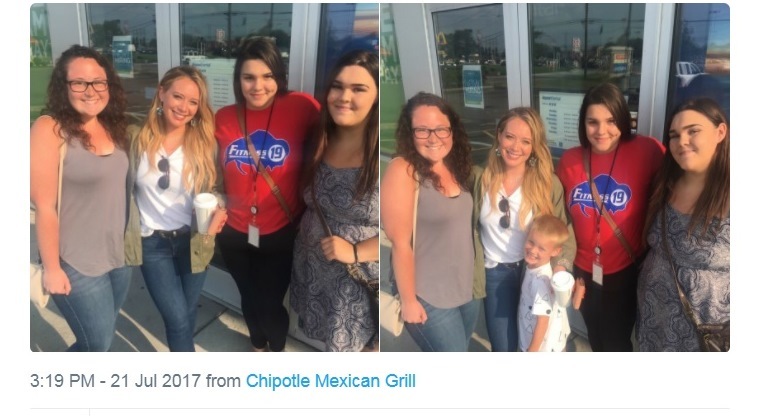 Little did she know this run-of-the-mill job on Walden Avenue would score her a photo with actress and singer Hilary Duff. The 29-year-old celebrity tried acting like she wasn't Hilary Duff, according to McIntosh's tweets. "But you can't fool me," McIntosh tweeted. McIntosh's post drew Duff fans who had a lot of questions and excitement. The Chipotle worker's reply was Duff just "wanted to eat some Chipotle." And McIntosh wasn't the only one who managed to snag a picture with Duff. Breanna Chauby, a fellow Buffalonian, said she recognized the actress and "she was very sweet, very unexpected." Chauby tweeted, "Definitely made my night."